Elizabeth Holmes is the founder and CEO of Theranos, a blood testing company out to revolutionize how blood testing is done. The company claims to have developed a blood testing device that uses only a few drops of blood from a finger prick instead of the usual vials of blood needed by more traditional tests. 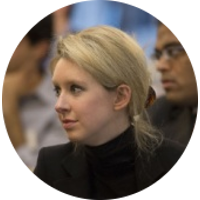 According to Forbes Magazine, the success of Theranos has made Elizabeth Holmes the world's youngest self-made female billionaire. However in 2015, questions were raised about the reliability of Theranos blood test results and the FDA accused Theranos of using an unapproved blood collection device. Elizabeth Holmes is the 3rd great-granddaughter of Fleischmann Yeast Company founder Charles Fleischmann.